The 108P: A more modern take on Stegmann's legendary comfort shoe. 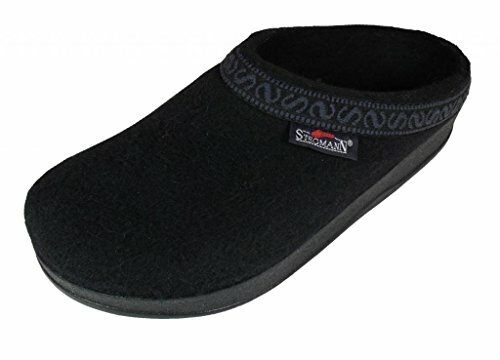 The anatomically correct Poly-Flex foodbed and the extra thick upper made of pure, new wool have established the worldwide reputation of this ultra-comfortable clog. Unadulterated Nature: The Stegmann felt clog is made from pure natural materials. 100% virgin Sheep's wool, cork, and natural latex enfold your foot in the most natural of ways. The wool upper is produced exclusively in the Tyrolean Alps, in harmony with nature. The Seamless Felt: Pure Sheep's wool of the highest quality is seamlessly and anatomically felted using Tyrol mountain water with no chemical additives. Only Stegmann are masters of this craft. Eco Friendly: Stegmann clogs are made in harmony with nature, using sustainable, natural materials. Parts made in Austria, and hand assembled in USA.